Now I can't tear Aidan away from your site -- he's hooked on nature footage! He particular enjoyed the woodpeckers, complete with some "Mystery Science Theater"-esque commentary along the way, which was very fun. At age 4, he understands my bookmarks so I have a feeling he'll be a frequent visitor to your site. Great birds! That's so cool he enjoyed it! Today I was trying to capture some footage of some Oriole's nesting. Nothing mixed down yet. 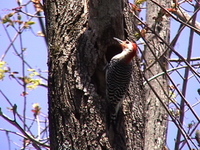 He might also like the hummingbird and gnatcatcher nest building videos, they are in the list above on the bilogy posts.